Home > PsA: What is Psoriatic Arthritis? > Hand/Foot Pain: How Can I Manage Psoriatic Arthritis Pain? Hand/Foot Pain: How Can I Manage Psoriatic Arthritis Pain? Affecting men and women almost equally, psoriatic arthritis is often confused with rheumatoid arthritis, and sometimes gout. Many symptoms overlap. The age of onset is similar in all three. And the diseases are progressive. However, one of the key distinguishing factors of psoriatic arthritis over its similar counterparts is the presence of psoriasis. In over 85% of cases of psoriatic arthritis, psoriasis is also present. Does this mean that if you have psoriasis you will get psoriatic arthritis? Not necessarily. Thirty percent of individuals living with psoriasis will go on to be diagnosed with psoriatic arthritis. However, if you have a family history of psoriasis, you stand an even greater chance of developing psoriatic arthritis later in life. Most people who develop psoriatic arthritis are diagnosed between the ages of 30 and 50. And the trigger for the onset of the disease can be a viral infection (e.g., strep throat) or as a response to extreme stress. Psoriatic arthritis is an autoimmune disease, in which your body attacks its own healthy joints. Most common symptoms of psoriatic arthritis are painful and inflamed joints, that are warm to the touch. Very commonly, psoriatic arthritis is an asymmetric disease, affecting different joints on either side of the body. Some of the most significant joints that are affected by psoriatic arthritis are in the hands and feet. In people diagnosed with psoriatic arthritis, 5 to 16% of them may experience a complication of the disease called arthritis mutilans. 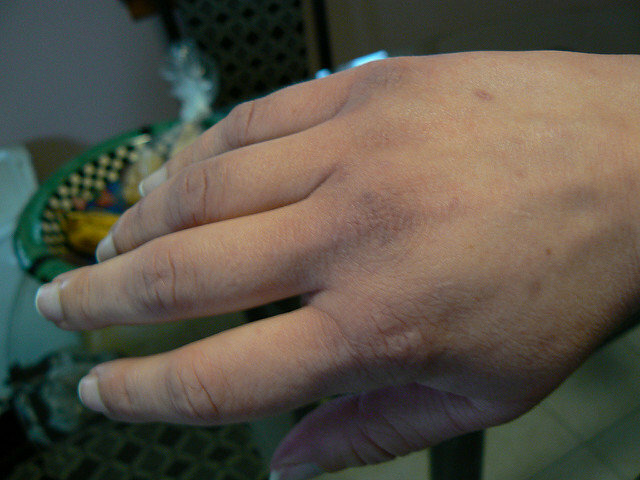 This development can result in such severe deformity of the hands, so severe they may become almost unusable. More commonly, people living with psoriatic arthritis will first experience hand problems when they notice opening a jar becomes painful, buttoning and unbuttoning a shirt becomes difficult, and counting out change becomes a chore. With 27 joints in the hand, psoriatic arthritis can wreak havoc. What are some ways that you might seek relief? If you’re experiencing psoriatic arthritis symptoms, there are a number of treatment options. Most commonly, NSAIDs and DMARDs are prescribed for pain management. Natural remedies are also great supplemental options for managing psoriatic arthritis symptoms. In our daily activities, we use our hands constantly, so it’s vital to manage the pain you might be experiencing from psoriatic arthritis. In addition to treatment options prescribed by your doctor, you can self-treat at home as well to provide more relief for your painful joints and prevent nail injuries that can spark a flare-up of symptoms. Toe swelling? Plantar fasciitis? Pain in your Achilles tendon? If you are living with psoriatic arthritis and are experiencing any of these symptoms, you are not alone. Psoriatic arthritis symptoms occur often in the feet. We use our feet just as much as our hands, so pain relief from psoriatic arthritis symptoms is important. How does this disease present itself in the lower extremities of the body? Enthesitis – tendon and ligament inflammation causing pain, damage to the joints and surrounding tissue. Pain in the arch of the foot may be Plantar Fasciitis. Pain in the heel may be Achilles tendonitis. As with symptoms of the hands, psoriatic arthritis symptoms of the feet are often treated with NSAIDs and DMARDs. Natural remedies are also gaining traction with this disease as well. In the following section, we will discuss various remedies you can do at home for self-treatment and prevention. If you are suffering from foot pain associated with psoriatic arthritis, you can practice lifestyle changes that will make your everyday life more comfortable. Decrease any activities that are aggravating the pain – including running or any other type of repetitive movements. 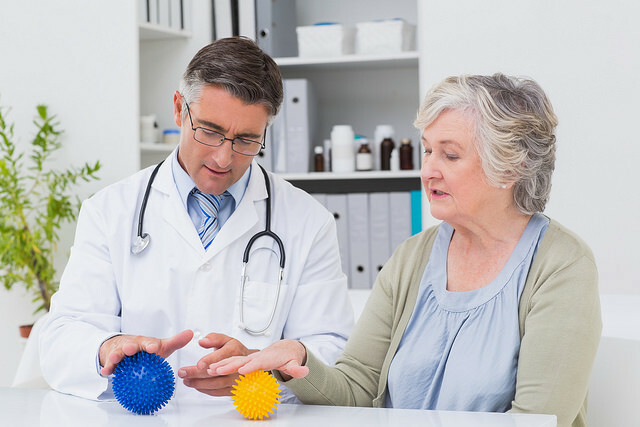 Consult with your physician and seek out activities that are beneficial but do not exacerbate the arthritis symptoms. Joint stiffness is very common in psoriatic arthritis. The most common times that joint stiffness affects the feet is in the evening or after being on your feet for long periods of time. 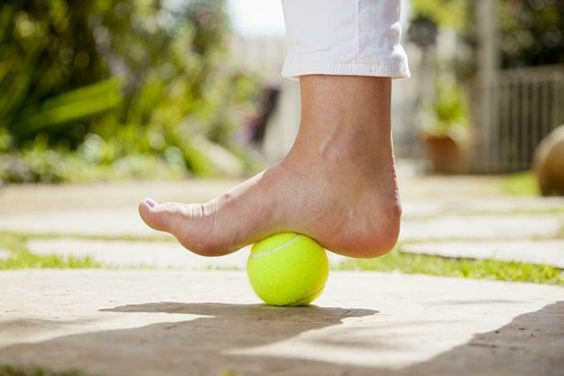 Swelling and pain can occur due to walking, requiring rest with your feet elevated. Shoes that are the wrong style or do not fit well may need to be changed. Foot deformities can occur fairly rapidly. So treatment should be started as soon as possible after the diagnosis is made. Joint damage can occur as soon as six months after the onset of psoriatic arthritis. Deformities can include clawed toes, inrolling of the ankles, and hyperextension of the big toe. Whether it is your hands, your feet, or both; psoriatic arthritis can cause painful symptoms that flare-up and affect your ability to engage in everyday activities, affecting your quality of life. It’s important to seek your doctor’s advice on medications and other treatment options that will help alleviate the pain and inflammation. The tips provided below are useful as a supplement to treatments prescribed by your doctor. Cold compresses – can work wonders to alleviate painful joint swelling. You can use an ice pack or a pack of frozen vegetables. If the cold is too much for you, place a towel in between the cold and your skin. Alternating between 10 minutes of cold and 10 minutes off is the generally prescribed activity for optimal benefit. Use a foam roller or frozen water bottle – especially to massage the arch of your foot, your heel, or your wrist. The cool of the frozen water bottle is an added benefit to reduce swelling as you roll. 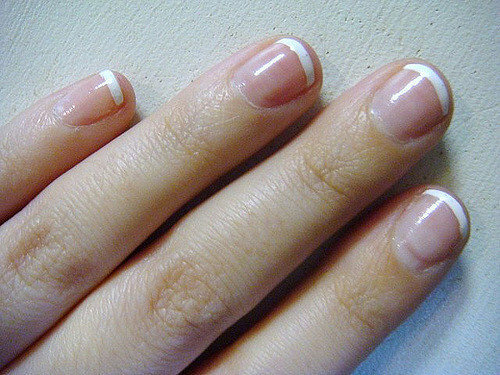 Maintain your nails – because nail psoriasis occurs in over 80% of cases of psoriatic arthritis, keep your nails healthy. Trim them regularly, file them to decrease snags, and moisturize to reduce dead skin. Watch your cuticles – when maintaining your nails, or getting them professionally maintained at a nail salon, don’t push back your nail cuticles or use a cuticle trimmer. Doing so can cause tiny tears in your cuticle. Skin injuries, even as minor as this, can trigger flare-ups of psoriatic arthritis symptoms and may increase your chance of infection (especially if you are taking immune-suppressant drugs to treat the disease). Soak your hands and feet (but not for too long) – engaging in a hand or foot soak can alleviate pain and swelling. However, don’t soak for too long as it can dry your skin out, making your psoriasis worse. Always make sure to moisturize your skin after soaking. Choose your shoes wisely – in addition to wearing wide-width shoes, open-toed shoes are also recommended for individuals living with psoriatic arthritis. This gives room for your toes should inflammation occur. Avoid shoes with a pointy toe box and high heels, which can push toes forward and cramp them. Stay dry – fungus grows in damp conditions. Wear moisture-wicking socks. And keep your shoes dry – look for materials that are breathable. If your shoes are wet, let them dry and air out before putting them back on.